Republished December 13, 2016, 11:45 a.m. to correct the RIN bank estimate. On November 23, the U.S. Environmental Protection Agency (EPA) issued its final rule for the 2017 Renewable Fuel Standard (RFS) program year, with higher targets than those initially proposed in May. EPA increased both the advanced biofuels and total renewable fuel targets while keeping the cellulosic biofuel and biomass-based diesel targets unchanged. 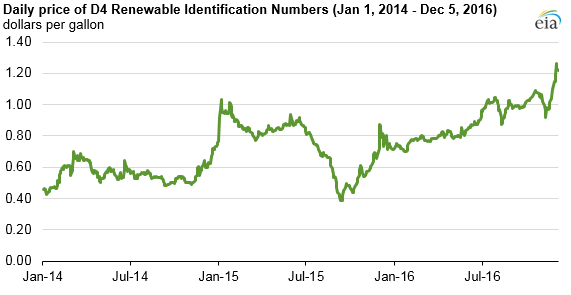 EIA used the 2017 RFS targets in the final rule in developing the U.S. biofuels forecast through 2017 for the latest Short-Term Energy Outlook (STEO). EIA expects that the rule will have the greatest impact on biomass-based diesel consumption, which is forecast to continue its recent growth into 2017, while ethanol consumption remains largely unchanged. Biomass-based diesel generates Renewable Identification Number (RIN) credits, which are used by refiners and importers of gasoline and diesel to meet the RFS targets for use of biomass-based diesel, advanced biofuels, and total renewable fuel. Biomass-based diesel RINs, also known as D4 RINs, are more valuable than D6 RINs for grain-based ethanol given their flexibility in meeting multiple RFS targets. Steadily increasing RFS targets for biomass-based diesel have led to increasing D4 RIN prices, which, along with the blender’s tax credit, have helped encourage growing levels of biomass-based diesel consumption in 2015 and 2016. 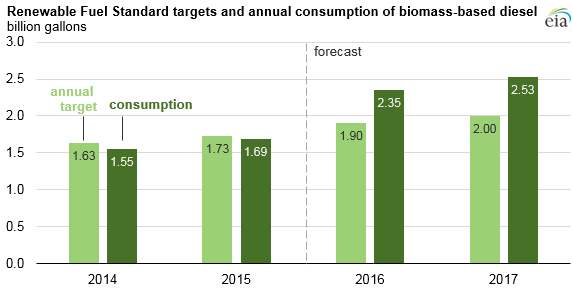 In its latest STEO, EIA forecasts that biomass-based diesel consumption will increase from 1.7 billion gallons in 2015 to a record level of 2.5 billion gallons in 2017, 0.5 billion gallons above the biomass-based diesel RFS target of 2.0 billion gallons. The additional biomass-based diesel will help meet the advanced biofuel RFS target. Ethanol is the most-consumed renewable fuel in the United States, and plays the largest role in compliance with the RFS target for total renewable fuel. EIA assumes that ethanol consumption will continue to be driven primarily by domestic gasoline demand. Almost all motor gasoline sold in the United States is blended with up to 10% ethanol, but infrastructure, economic, and distribution issues still limit significant growth in ethanol blends above 10%. Ethanol consumption averaged about 14.0 billion gallons in 2015, and it is forecast to average 14.4 billion gallons in both 2016 and 2017. This level of consumption results in the ethanol share of the total gasoline pool averaging 10% in both 2016 and 2017. Any shortfalls in RFS compliance in 2017 are expected to be met by existing RINs in the RIN bank: a supply of RINs generated in previous years in excess of the RFS targets in those years. On November 23, 2016, EPA estimated that approximately 1.54 billion gallons can be used for compliance in the event of a shortfall heading into 2017.